Virudhunagar is a famous Business city where main businesses are concerned with dry-chilli, pepper, oil and Dhal. When the people were economically well off through their trade and commerce, they wanted to improve their social status through education. So, they established an organization for themselves in the name of Uravin Murai for the upliftment of their community through education. They started many educational institutions for boys under the control of KVS Managing Board in 1889. The ardently wished to impart education to girls and uplift them. So Kshatriya Girls’ Schools’ Managing Board was established in 1910 and started Kshatriya Girls Middle School. Thiruvalavai Nadar took the initiative to strengthen the school. P.S.Chidambara Nadar, the leading merchant and philanthropist, rendered hearty co-operation to him. By their incessant tireless work and liberal donation the school set its foot slowly and steadily year by year. That school was upgraded into high school and named as KGHS in 1943. Then SVA middle school was established in 1953 to facilitate the rural children in and around Virudhunagar to get the benefit of education. Then the well wishers in the town realized the importance of English and the social status of the educated people enjoying high position in the society. KGSMB immediately fulfilled the long felt need of the town by establishing an English medium school right from kindergarten for girls on 23rd June 1975. They named the school after the magnanimous philanthropist Thiru. P.S. Chidambara Nadar the Father of Women Education in Virudhunagar as P.S. 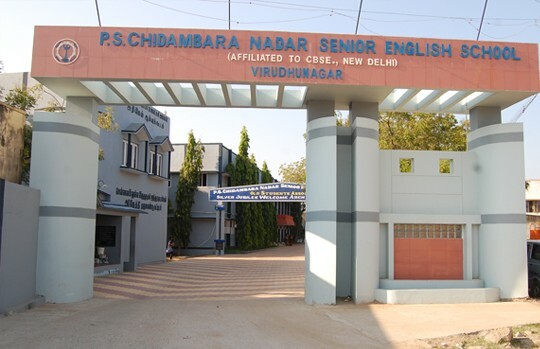 Chidambara Nadar Central School with the Motto “LOVING SERVICE”. The founder Secretary of the school was Thiru O.T.S.V. Dharmar Nadar. The UKG classes were started with twenty nine girls. The Board was able to nurture it into full fledged Primary school. The school was upgraded into middle school in 1981. When the first set of students were in std VIII, affiliation was applied in 1983 after getting NOC from the Department of school of education, Chennai(L.Dis No. 142608/E3/83 Issuing Date : 2.11.1983). The Inspection Committee visited the school and affiliation was granted on 1.5.1984 and the name of the school was changed into P.S.C English School. The first set of 20 students appeared for AISSE in 1983 and came off with flying colours. As the board wished the students to continue their higher studies in CBSE syllabus, they started +1. So the school was upgraded into PSC Senior English School on 5th July 1990. 17 girls were admitted in +1. 13 girls appeared for AISSCE ’92 and got centum results. Nearly 9 sets of students appeared for AISSCE till 1999.